There's a new free educational game website in the cyberworld: Game Classroom. "Game Classroom is a one-stop web destination for accessing high-quality educational games, and homework help for K-6 students." 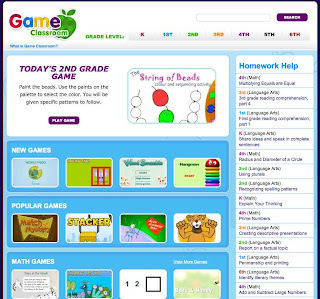 Games from all over the web are sorted according to skill, topic and grade level. It's a nice neat and attractive interface. There's a homework help section with learning tips, online resources and sample problems. According to the site, content was created by professional educators with over 200 years of teaching experience, and has been outlined using US state educational standards. I liked the fact that there are games here simple enough for the under fives, yet more challenging ones too. Poem Pack where I listened to poems then chose rhyming words. Game Classroom actually leads you to external sites some of the time eg Poem Pack is on the BBC Schools site. This is a great way for parents and teachers to become aware of the many useful educational sites out there, without having to sift and sort themselves. I couldn't make the search feature on the home page find a game I'd previously played, but that could be browser conflict. Also, one of the games I chose (Letter Rip) led to a site that suggested I pay to avoid popup ads, and also download the game onto my computer before I could play. As always, I recommend parental guidance. Generally though, I was impressed with the opportunities that Game Classroom offers kids to develop literacy skills and test their knowledge in a safe and fun environment.